I am the least timely blogger ever. Like today I am posting Wednesday’s photo of the day. Today is Saturday. But it’s okay because Wednesday all I managed to photograph was my bizarre dinner. 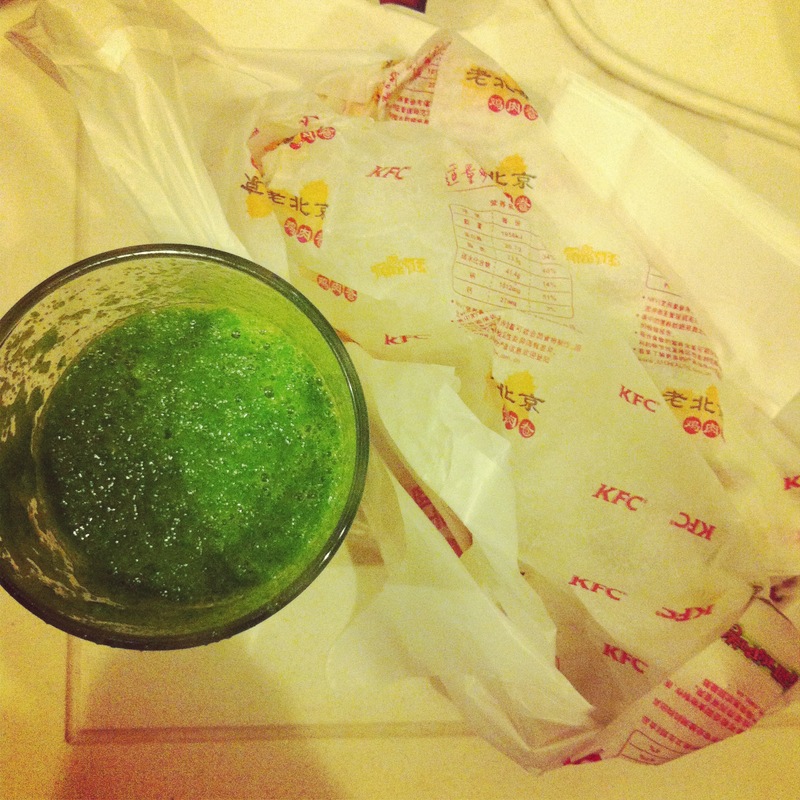 A KFC wrap and self-made green smoothie. So KFC is kind of gross in the United States. I am not a fan. But here they put a Chinese spin on their food that is CRAZY DELICIOUS. Right now I am obsessed with the wrap above which is basically strips of fried chicken and cucumber with duck sauce in a warm, pressed tortilla. It is no joke, the best fast food I have ever had in my entire life. Last week I tried it for the first time and ending up eating Peter’s wrap in addition to my own. You have no idea… it is the most delicious thing ever. Oh yeah, the green smoothie was… well green. And gave me a stomachache. Sometimes too much fiber is a bad thing. If only I could make these KFC wraps at home. But that would take a lot of skill and deep fryer. Can you deep fry in a wok? After this bizarre dinner we went over to a friend’s house for movie night. We saw 21 Jump Street which was fantastic!! I absolutely loved it! Almost as much as that KFC wrap. But really 21 Jump Street was absolutely hilarious and so much fun. For some reason I really resonated with the high school references and Channing Tatum’s humor. HIGHLY RECOMMEND THIS MOVIE. I need to watch it again. KFC wrap in hand. Two of my favorite things all at once.